Japan is releasing the Leading Indicators and 30-y Bond Auction data and the US will publish Crude Oil Inventories, Natural Gas Storage, Revised Nonfarm Productivity q/q and Unemployment Claims. 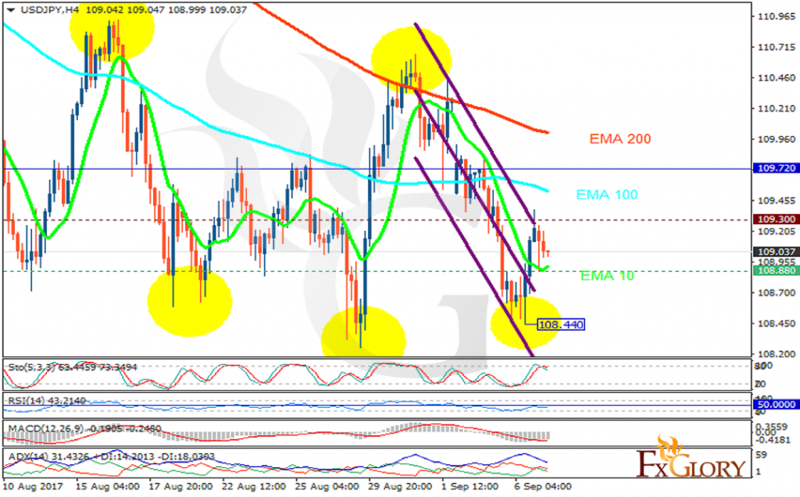 The support rests at 108.880 with resistance at 109.300 which both lines are below the weekly pivot point at 109.720. The EMA of 10 is moving with bearish bias along the descendant channel and it is below the EMA of 100 and the EMA of 200. The RSI is moving below the 50 level, the Stochastic is showing downward momentum and the MACD indicator is in negative territory. The ADX is not showing any clear signals. The support level breakthrough will smooth the way for further decline towards 105 area otherwise the price will grow to 109.45.